A purple reclaimed wastewater irrigation sign in Flagstaff. The purple signs indicating use of reclaimed water that are scattered throughout Flagstaff are a familiar sight for the average Arizonan. 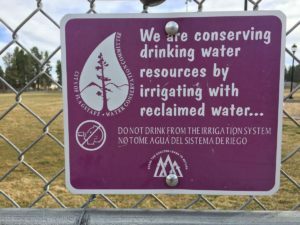 If you aren’t familiar with the purple pipes and signs don’t worry – as a transplant from Idaho, a state rich in fresh water resources, I had very little experience with reclaimed water prior to moving to Arizona. But for the sake of this article, let me bring you up to speed: reclaimed, or recycled, water is treated wastewater. In Flagstaff, the Wildcat Hill and Rio de Flag water reclamation plants deliver treated water for irrigation of public spaces, manufacturing, and a variety of other purposes. Reclaimed water accounts for 20% of water delivered to the community. In addition to the reclaimed water delivered to its customers, Flagstaff discharges 100 gallons per minute of reclaimed water into the Rio de Flag. The flows provided for the stream by this reclaimed water support wildlife habitat, groundwater recharge, and recreational opportunities for residents and visitors alike. Arizonans are accustomed to the idea of reusing wastewater, but this is not the case globally. Worldwide, over 80% of wastewater produced by society flows back into the environment without being treated or reused. And that’s why this year’s theme for World Water Day asks us to consider, “why wastewater?” This day of action, held every year on March 22nd, is an effort to take on the global water crisis. But in the arid State of Arizona, reclaimed water use has become necessary to meet our daily water demands. And so, you might be thinking to yourself, “Why wastewater?! Well, out of necessity, of course!” But the global organizers of World Water Day are challenging you and me to think beyond necessity. What can we do as individuals and a community to address decreasing water supplies and growing water demands? As an individual, you can reduce your freshwater consumption by irrigating with grey water- wastewater that originates from your washer, bathtub, or sink (but not the kitchen sink, dishwasher, or toilet). Additionally, you can sign up for Conserve2Enhance (C2E) to track your water savings and donate the money you save on your water bill to local environmental enhancement projects. Make sure to check with the City of Flagstaff regarding the specifics of using grey water, as well as to take advantage of City rebates that support high-efficiency toilets, rainwater harvesting, and xeriscaping. As a community, we can work together to address two uncertainties associated with wastewater. First, we can support further research on the potential health effects of wastewater on humans and the environment. Second, we can encourage further discussion regarding the 20-year agreement between the City of Flagstaff and Arizona Fish and Game which provides in-stream flows to the Rio de Flag. The agreement will end in 2030, and we need to be proactive in opening these discussions. These flows provide important riparian habitat and create a unique amenity for Flagstaff residents. Why wastewater? Share your thoughts with us on our Facebook page.